Scanmarker is an extraordinary invention of this era. It is a pen-shaped scanner. It is the very beneficial product for the student and the readers. You can scan any printed text and it appears automatically in any application on your computer. You will never need to retype printed text from documents again, letting you focus on getting your work done. All you have to do is to just scan the Scanmarker across a line in your book, just as if you were using a highlighter pen, and the text will be automatically transferred into a Word or Excel document or into another application. The scanner has several modes to transfer data to your computer: ”Data Entry (Scan & Paste), Multiple Language Translation, Text-To-Speech, Dictionary, Thesaurus, Image Reader, and Business card reader.” It can even scan an image into your notes document. It “also functions as a personal reading guide, enhancing text comprehension, pronunciation, and reading autonomy for students and adults with reading difficulties.” It recognizes characters sized from 8 to 24 pt, and it has a scan field of 0.4? and optical resolution of 350 dpi. It requires a USB connection and will work for left- or right-handed readers. It is not difficult to use. It really works like magic. As discussed earlier, it is like a simple highlighter; run it over the lines in your book or article and the text transfers to your PC. The ultra-portable design lets you carry it anywhere. Collect key sentences with Scanmarker instead of highlighting them to quickly create a summary of important notes, allowing you to do more in less time. This scanner does what your smartphone can’t. The OCR (Optical Character Recognition) technology does the heavy lifting for you. Great tool for students with dyslexia and other learning disabilities: Stay engaged as you read without breaking concentration. Scanmarker does the typing as you take notes. 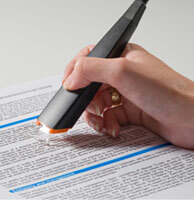 Scanmarker can also read text out loud to improve reading comprehension. No buttons, rollers, gears or moving parts to fumble with and no recalibrations when the light ambience changes. Streamlined for maximum efficiency and zero problems.